Bullseye Event Group announces a new Super Bowl 2014 travel package for football fans still searching for a place to lay their heads that week in New York. You will be pleased to know there is space available at the Ameritania. Stay at the Ameritania during the Super Bowl and have access to the fun. Bullseye Event Group, one of the nation’s leading event and group ticket companies, announced today that they have a new hotel package available for Super Bowl XLVIII. The package will accommodate guests and their travel partners for up to three nights at the Ameritania Hotel. Football fans still searching for a place to lay their heads at night during Super Bowl XLVIII week in New York will be pleased to know there is space available at the Ameritania Hotel. Located only a few blocks away from Super Bowl Boulevard, the Ameritania is a modern, contemporary hotel, seated in the heart of Times Square. The Ameritania Hotel is attached to the Ed Sullivan Theatre, home to the Late Show with David Letterman. 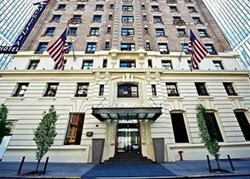 It is within quick walking distance of Central Park, 5th Avenue shopping, Lincoln Center and Carnegie Hall. The Ameritania has much more to offer than just a room for the night; this hotel is prized for its spacious design, and guests will find they have ample room to enjoy their New York City stay. Rooms are not only spacious but are elegantly designed, and are accompanied by all the amenities needed during an NYC vacation. Soon to be announced, the Ameritania is opening a new restaurant that will feature one of the Top Chef’s in the world. In addition to this fabulous restaurant, there is also a lounge bar and a coffee shop on site. The Super Bowl Players Ultimate Tailgate is a pre-game Super Bowl party that offers celebrity guests, live entertainment, a five star food menu prepared by international super chef Marcus Samuelsson, and open premium bar from 11am to 4pm Super Bowl Sunday. The name, Super Bowl Players Ultimate Tailgate says it all. This is where the current active players come on Super Bowl Sunday, 20+ current players will be in attendance. The venue is Gotham Hall one of NYC’s finest venues. Cirque USA will be on hand to provide background entertainment. Vy Higginsons Gospel for Teen Choir from Harlem will also perform. A Super Bowl Chalk talk will be given by a TBA determined guest, last year Bullseye Event Group had Michael Strahan provide his insight and Super Bowl experience. The Super Bowl Players Ultimate Tailgate is the premiere pre game event on Super Bowl Sunday. As a secure, official source for travel, hotel, pregame parties and tickets, Bullseye Event Group is a direct and dependable source for Super Bowl packages, delivering unforgettable experiences to fans.